These types of electrical pumps are installed in a pit usually in a basement and are designed to work underwater. They have a float-activated switch or check valve that turns the pump on when the water in the pump causes the check valve to rise. 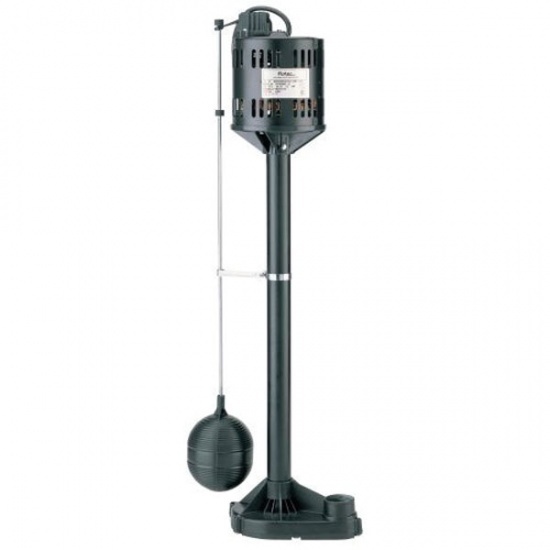 Universal Plumbing & Sewer, Inc. recommends a cast iron sump pump. Our trucks are fully stocked with Zoeller and/or Liberty pumps in 1/3 HP & 1/2 HP. The submersible sump pumps are quieter than other styles and tend to have a longer life because their sealed, oil-cooled motors are protected from moisture and dust. An electric pump that stands upright, with a motor a few feet above it that is not meant to get wet. It has a float-activated switch that turns the pump on when the water reaches a certain level. This type of sump pump is ideal for basements needing frequent water drainage. They usually are the least expensive but are noisier than the submersibles. This type of pump runs off the water pressure from your home's plumbing system and has the same float-activated switch. These pumps handle water at a comparable rate to the electric types, but require no electricity to operate. It can be installed along side an electric sump and is generally used as a back up system during a power failure. If you have a finished basement or use the space for storage, a back up sump pump is a very cost effiective way to gain peace of mind. Please contact our office for more information or to schedule a free estimate. There are multiple types of sump pump alarms. Some make a loud beeping noise or siren in the house to alert the homeowners that the water level is reaching an unsafe level, while others are able to send an alert via text message. Not only do they range in types they range in price everywhere from approximately $65 to approximately $350 installed depending on your specific needs. Where does your sump pump take all the water that it pumps out of your basement? Ideally, that water should be carried up and out of your house to a place where it won’t seep back into your foundation; that is the main goal of a sump discharge line. If the line is too short or leads to a place where the ground slopes toward your house, the water will just end up right back in the sump pit where it started, overworking your sump pump and increasing your risk for a basement flood. The best sump discharge line placement is different for every home; many factors, such as landscaping, yard slope, and more must be taken into account. Additionally, the line must be correctly sized and designed in such a way that prevents clogs and freezing. Luckily, our expert technicians at Universal Plumbing & Sewer have years of experience and know what to look for, and we can help you determine the perfect solution for your home that will keep the water out for good. We’ll streamline the process so you don’t have to worry! Your sump discharge line doesn’t have to be an unsightly pipe pouring water all over your yard either. We can install the line underground without disturbing your existing landscaping features. And if you have a drainage ditch or storm drain nearby, we can route the line directly to it. There are plenty of options for you to choose from that will work with your landscaping. It is illegal in most areas to have your sump pump discharge to the municipal sewer system, since addition of groundwater into the sanitary sewer can easily overwhelm the water treatment facilities during a storm and cause the sewers to back up (read more about that here). If your sump pump is hooked up to the sewer, don’t be afraid to call us! We’ll fix it and help you come up with a landscape-friendly solution that is 100% safe and legal. Choose Universal Plumbing & Sewer for expert 24/7 service you can trust! Call us at 586-459-0040 for more info or to schedule service.